Features:Utilising Hall Effect sensors the pre-loaded video presentation will auto play when this catalogue is opened. Offering a full colour print in matt or gloss finish this catalogue includes; a 4.3 inch LCD panel with 320 x 240 pixel resolution, 256 MB capacity for a 15 min play time and rechargeable battery with 2 hour capacity. USB charge cable included. Extra options include - start-up logo, multiple videos, mailing cover, buttons, increased memory and battery capacities, UV and foil finishes. Product Colour:Grey (Cool Grey 11C), White. Customised colours - MOQ 200 pcs. Features:Square shaped car charger with dual USB output, including power signal light. The location of the USB outputs makes this item suitable for any car brand. Input : DC12-24V, Output : 5V/1A, 2 x USB plug. Features:This cylinder shape speaker shows blue LED light dancing on the rhythm of the music. Excellent sound quality with powerful bass. The rechargeable battery enables 2.5 hours of sound. Features:Bluetooth speaker with black rubber coating finishing. Working current <30 mA (Bluetooth pairing module), < 400 mA ( Power amplifier ), < 3 mA ( Standby). Can be used up to 10 meters away from your music device. Includes a Lithium Battery, USB charge cable and user manual. Features:Cylinder shaped speaker with build-in battery, easy cable storage, 2W output speaker and adjustable sound angle. Built in lithium Li-on battery. Features:Slim design Bluetooth (V3.0) head set. Works with multiple devices. Including multi-function on & off switch to answer or terminate incoming calls, adjust volume, song, etc. Can be used up to 10 meters away from your music device. Working hours 10 hours (listen to music), 11 hours (calling), 250 hours (standby). Charge time: 2.5 hours. Includes Lithium Battery, USB charge cable and user manual. Features:Flat cable earphone with great sound quality. Impedance: 32 ohms, sensitivity: 105±2 dB, frequency response: 20Hz-20,000 Hz. 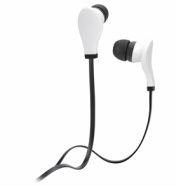 Including 3.5 mm stereo plug.